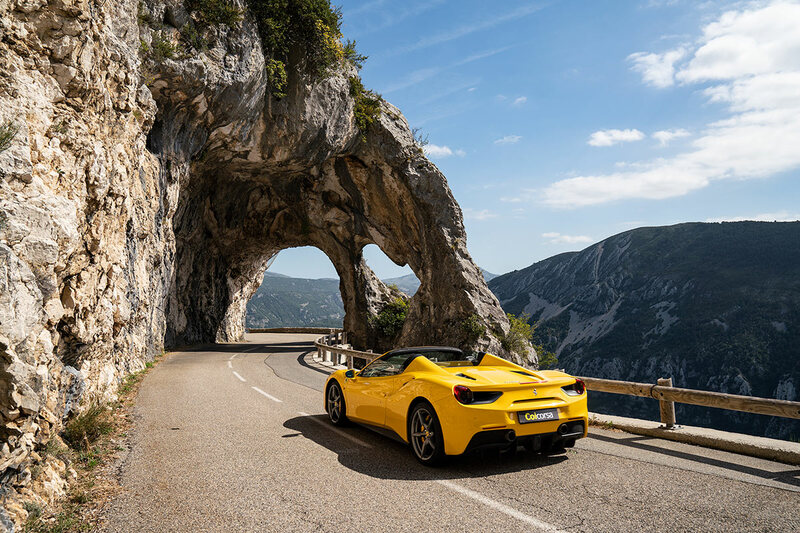 Route Napoleon in a Ferrari 488 Spider - Côte d'Azur's best driving road? 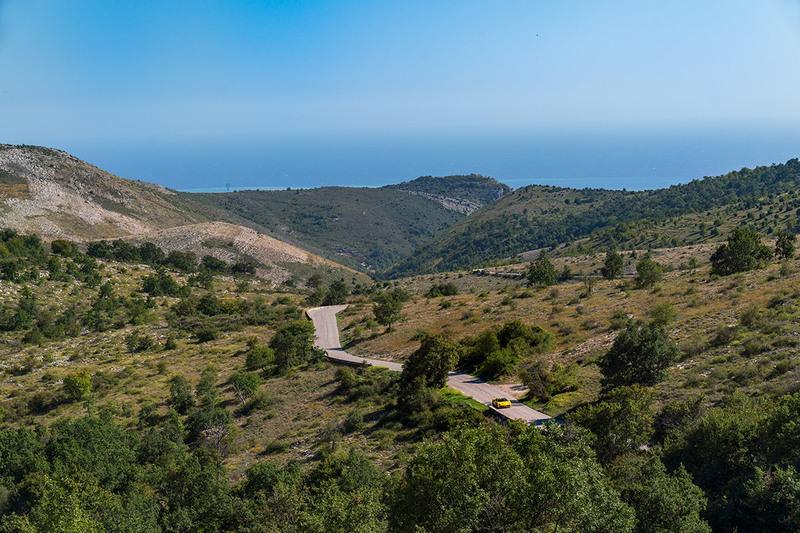 For three days back in September the sun seemed to shine a bit more bright, the roads we travelled on – driving nirvanas such as Route Napoleon – became even more picture perfect than before, and the view from our bedroom window was even more magical than usual. 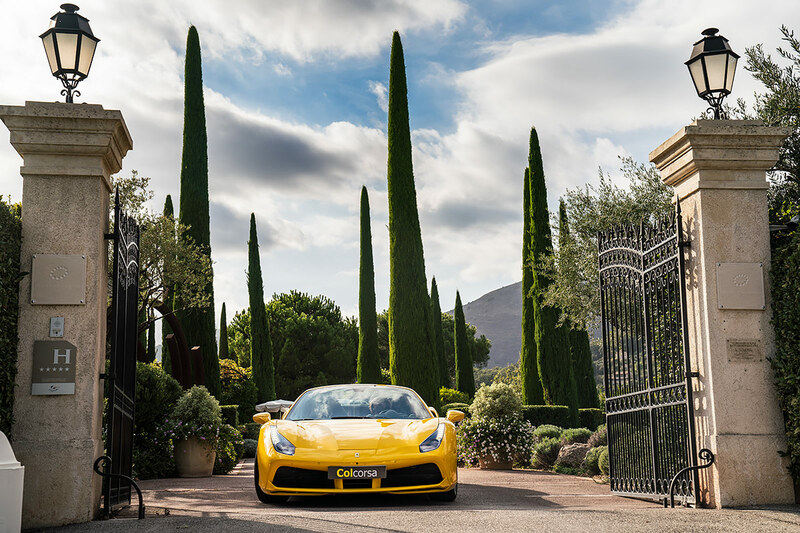 That’s because we had the keys to a shiny yellow ‘giallo modena’ Ferrari 488 Spider, and for a few beautiful days, parked on our driveway, it felt like our Ferrari. 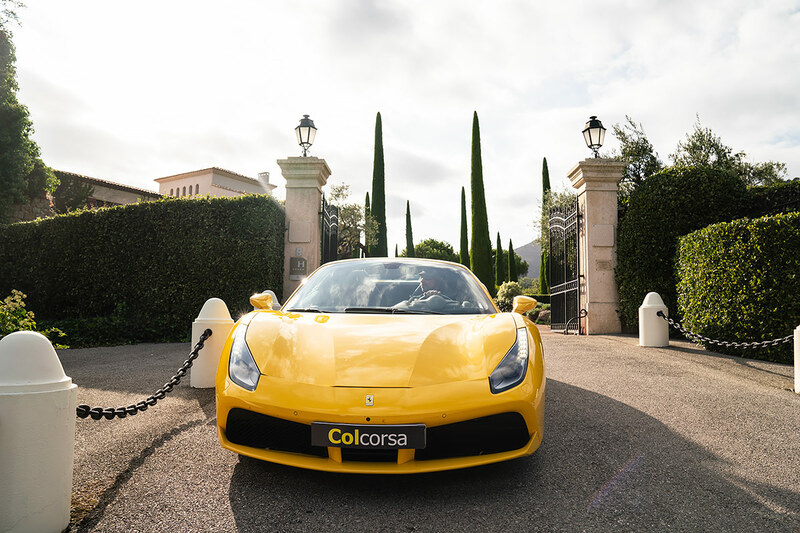 Sadly that wasn’t the case, and those moments are now only a precious memory – but also, luckily, a journey that was documented in hundreds of photos, because you never know when you’ll next have the keys to a yellow car – so you better make the most of it. The purpose of our adventure was a simple one. 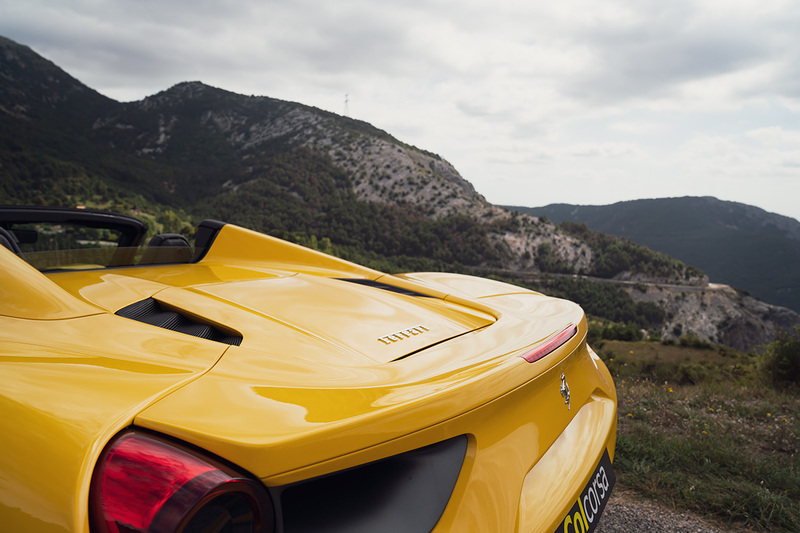 I browsed through my archive of photos from Colcorsa tours, and amongst the limited edition supercars racing on Route Napoleon, and the extensive archives of road photos, I simply couldn’t find the shot I was looking for – the one that you love so much that you want to print it everywhere, for the whole world to see. Because none of the cars were yellow, and when your heart is set on something it’s difficult to settle for a compromise. 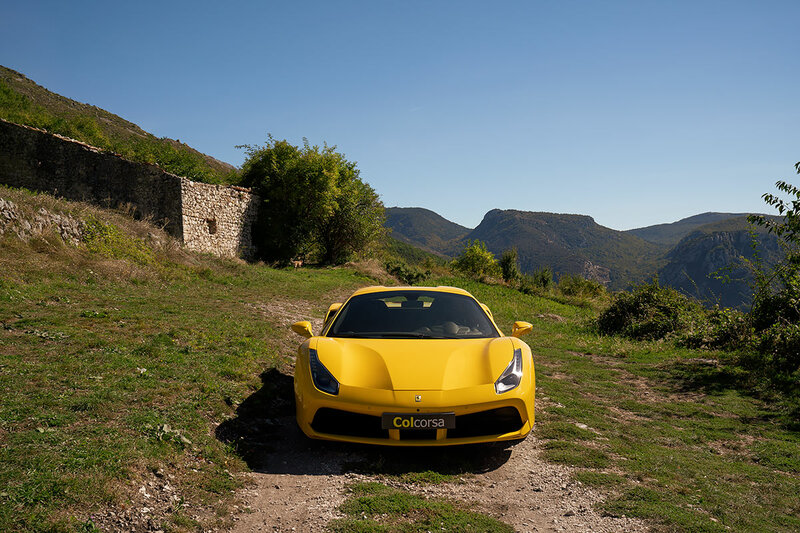 I wanted a photo of a yellow supercar on some of the most beautiful driving roads in the South of France – Route Napoleon and Route de Thorenc. A call to one of our partners. 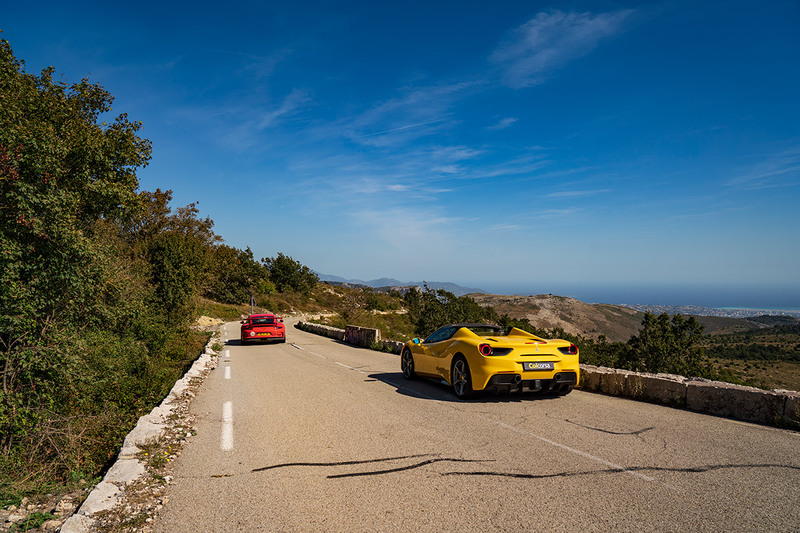 ‘Please, help, we can’t find a yellow supercar anywhere else, so we desperately need your yellow 488 or Huracan for a photo shoot on Route Napoleon’. And what a partner, because some days later we were out on the open road heading up on the fabulous Route Napoleon, with the roof down and the sun warm on our face, and the sound of a V8 echoing between the mountain walls – two in fact, because our daily driver, the BMW V8 E90 M3, joined the adventure. Often I hear Dan describing some of the special cars Munich Legends sells as ‘driving it is an event’. 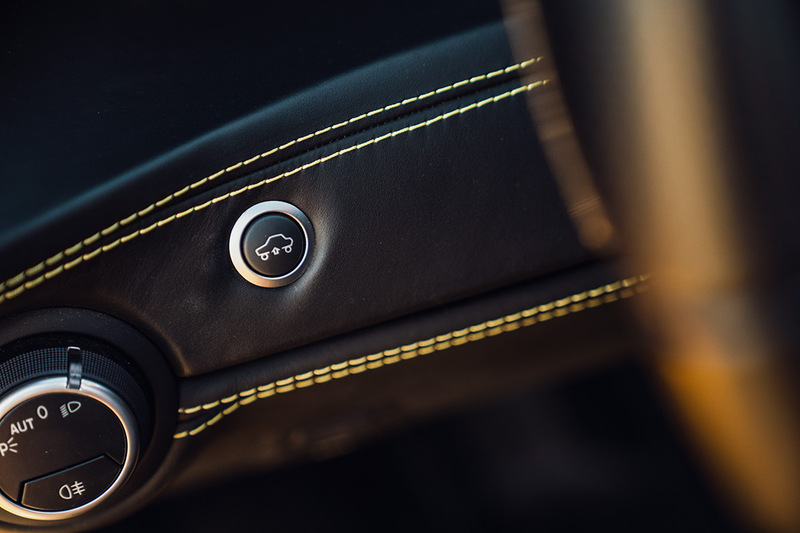 What a lovely way to put it, because ultimately that’s really what driving is about – it should be a special event, in a special machine, and if it doesn’t feel like that you should start looking for a more exciting companion (car, not the co-driver…). 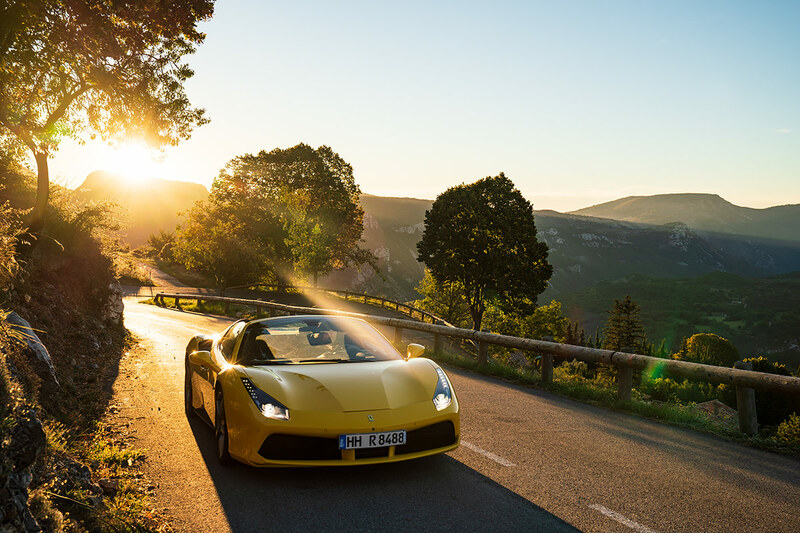 The Ferrari 488 Spider is without question an event, a spectacle, a dream come true, and a moment of irrestistible, beautiful madness. You’re running up the petrol bills as a short journey becomes a full day excursion – but cars like this were never designed to be parked up anyway. One day turned into three, because we were in no hurry to return the car, as you probably understand. Luckily our kind friends weren’t in a rush to get the car back either, so one cloudy sunrise was soon forgotten as we woke up to a clear sky the next day, a blast over Route Napoleon was followed by a second one in the other direction, and the car just grew on me. It started to look better and better on the driveway, to the point that I asked myself if anything can ever fill that empty space it would leave behind, with the same amount of majesty. Nevermind that it was a squeeze to get it up our narrow driveway, and an entry and exit that should take 10 seconds might take couple of minutes in a Ferrari – I have minutes to spare for the special events. 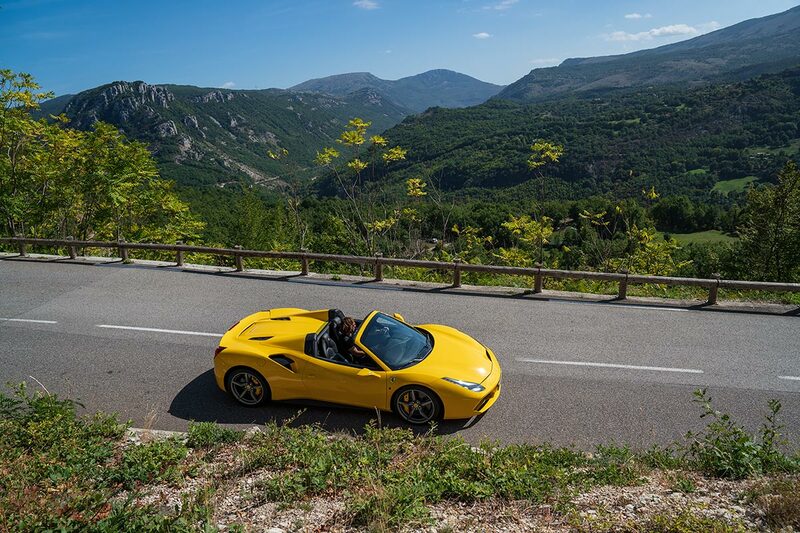 Because once you’re out on the road you can have the time of your life in a Ferrari. We headed up on Route Napoleon and I became more confident behind the steering wheel as we journeyed up to higher altitudes. 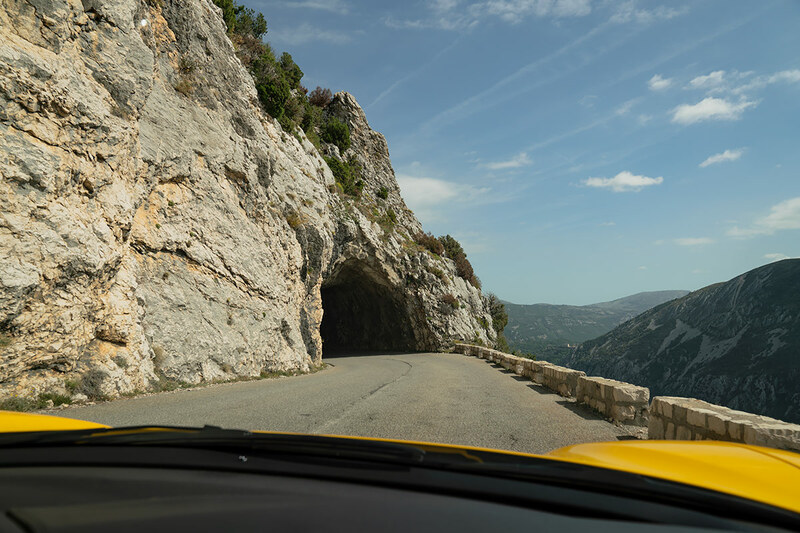 It was without a question a beast on the road, gently following the sweeping mountain wall, but as the bends got tighter it was time for the real test – would it corner with the same precision as one of my favourite driver’s cars, the GT3? 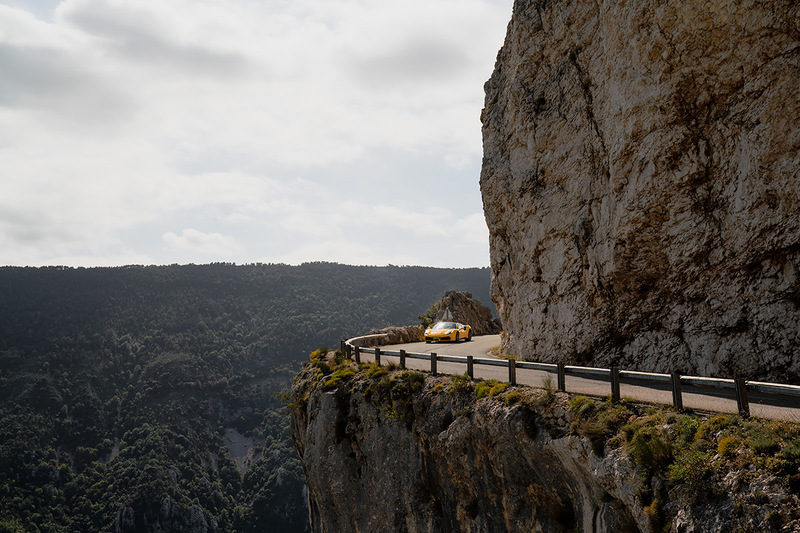 It’s a slightly wider car to manoeuvre around the hairpins – 10 cm – yet it gives you the impression that you’re driving an even bigger car. 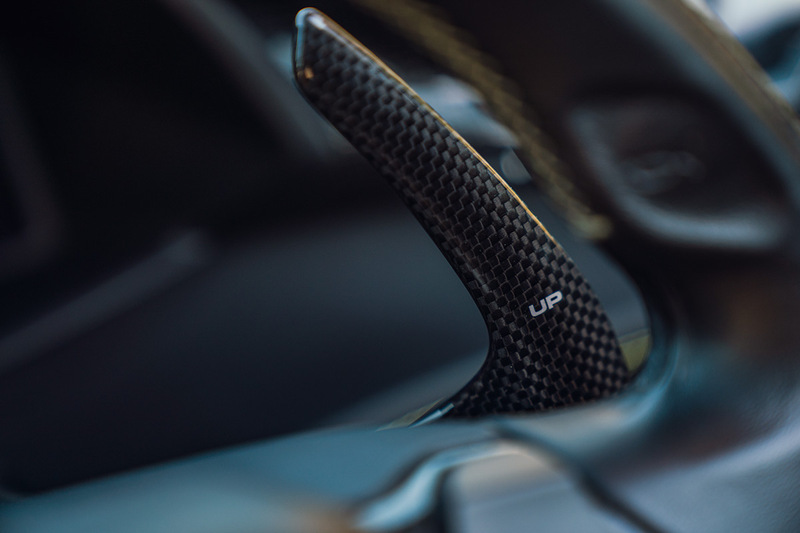 It doesn’t stay glued to the road as well as a GT3 does, but after a few corners you start to trust it, and by the end of the day you’re crying out for a little more time because you were just starting to get a hang of it. That’s perhaps the best way to describe it. A Porsche 991 GT3 is so brilliantly designed that you can’t really go wrong with it – it wants to go exactly where you point it at any speed, no matter how tight the corner is, or how late you left the braking. 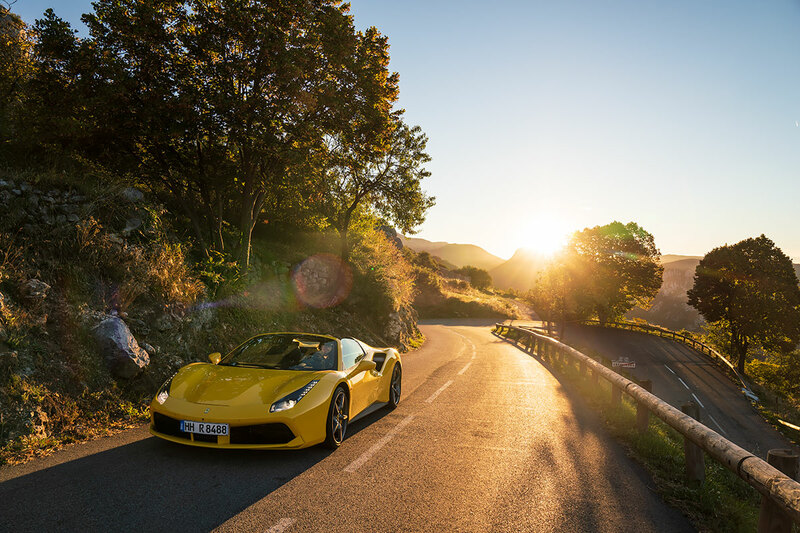 To reach the same amount of confidence as a driver behind the wheel of a 488 Spider might be a slightly longer process – especially as our daily driver is a slightly more modest machine, and the power in a 488 makes you a little humble. 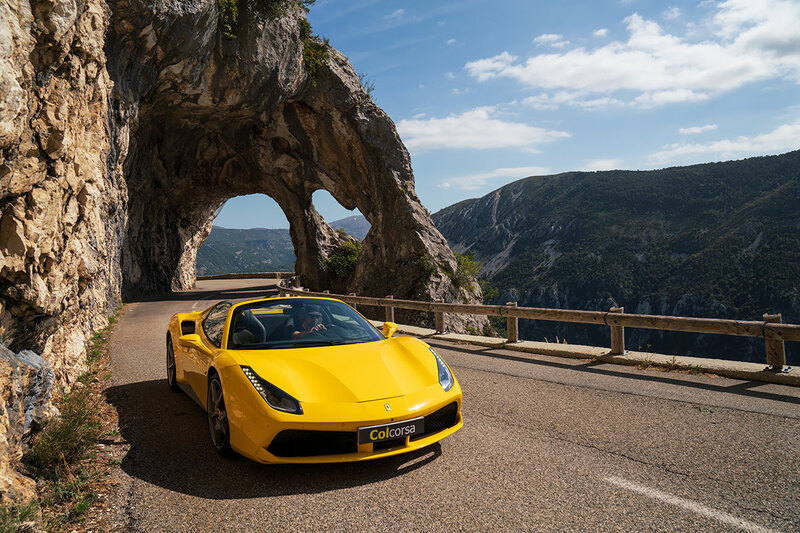 But when you get there it must be one of the most rewarding driving experiences – to be able to drive an Italian supercar like it deserves to be driven, or at least the closest you can get outside a race track. 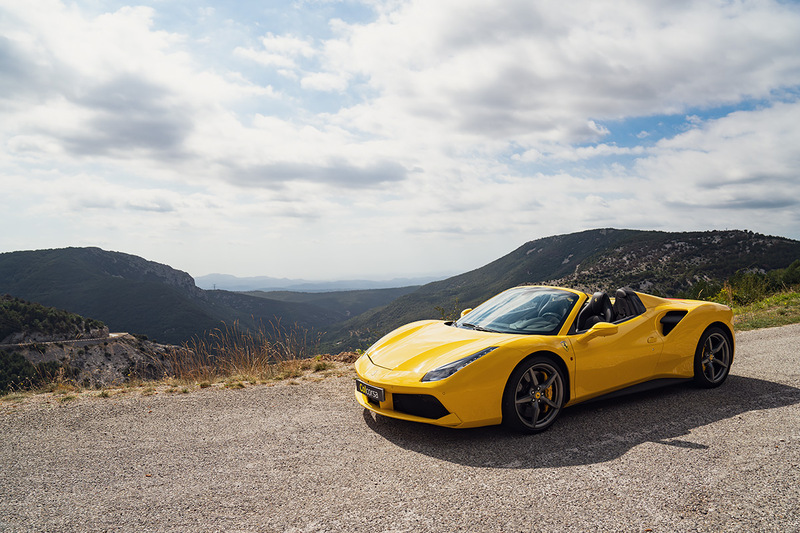 I feel I only touched the surface of the performance that the 488 Spider’s 660 horsepower 3.9L V8 engine would be capable of delivering. 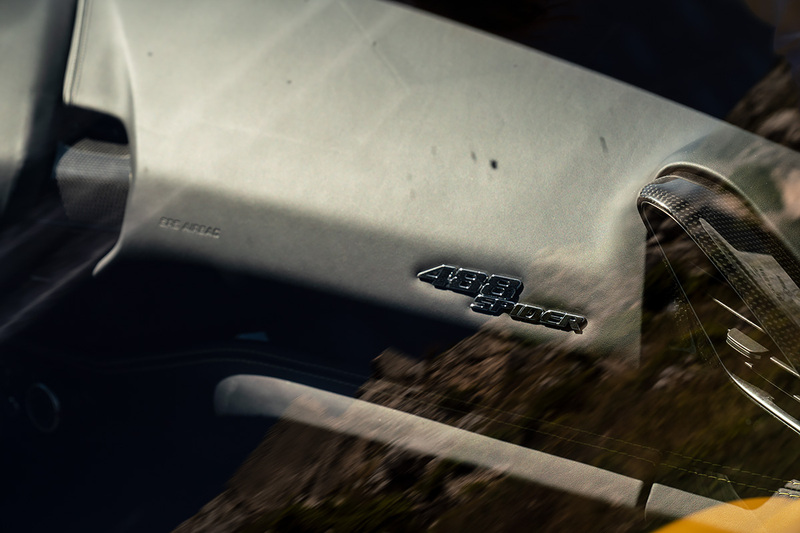 With that said, owning one would probably be pure joy, as you pushed it only to find it had the power and technology there to enable you to drive it even harder – every time. I can see what people mean when they say it’s hard to get enough of driving one. 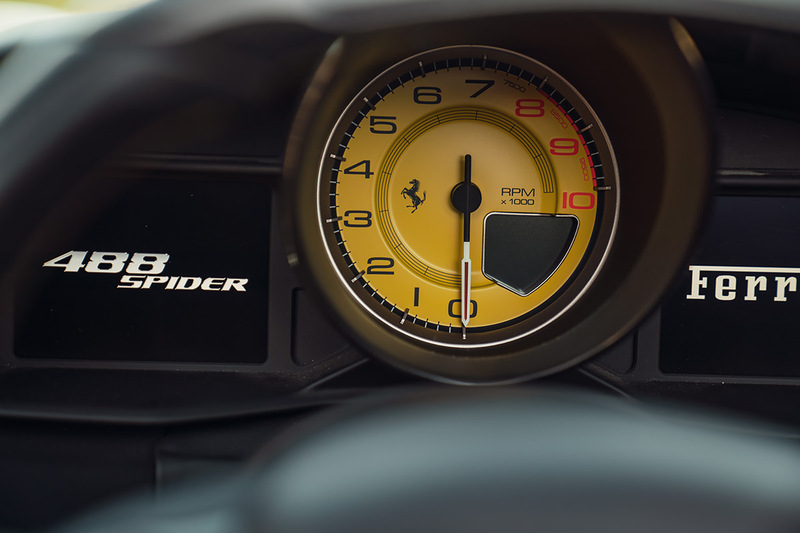 It makes you lust for some track time, too – and that’s when you ask yourself if you’d buy the Spider, which is a much more appealing daily driver, or the GTB, which without question you’d end up lapping around a race track. 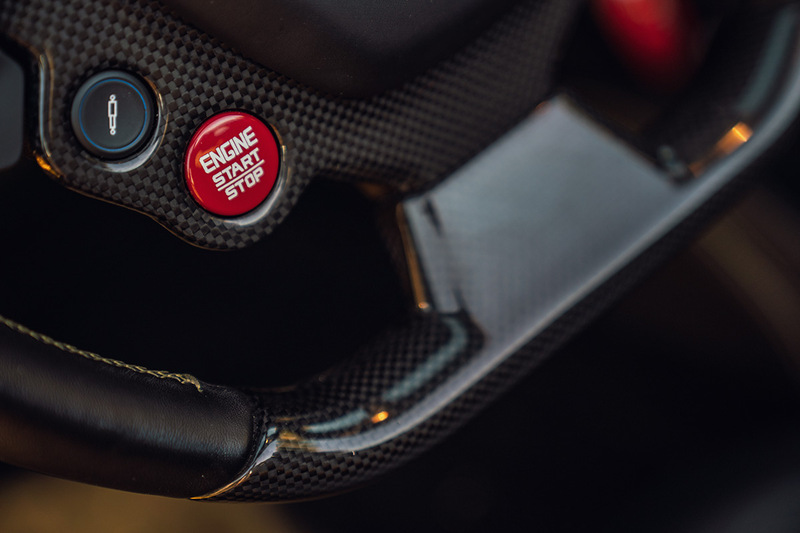 Because every moment spent in a 488 just builds up the frustration, until one day you’ll scream ‘I just want to go flat ooooout’ – and book a track day. 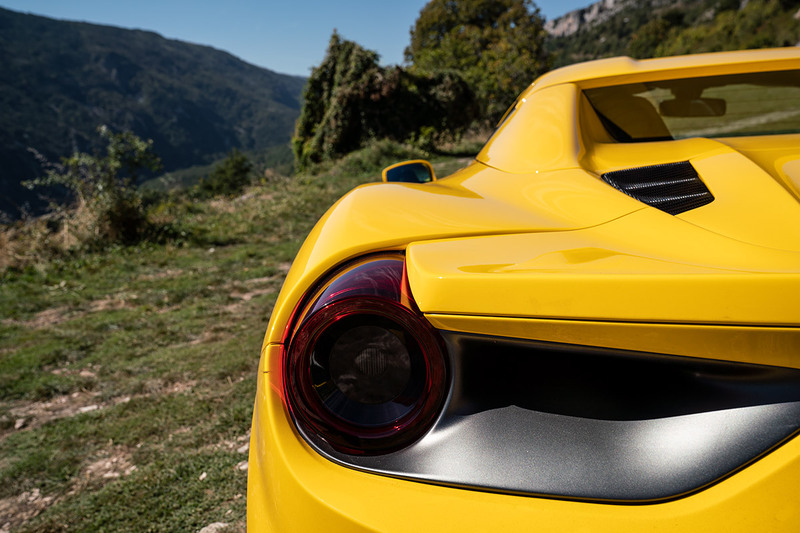 Some cars, and the 488 is one of them, are so fast than it’s impossible to unleash their full potential and DNA on the road. 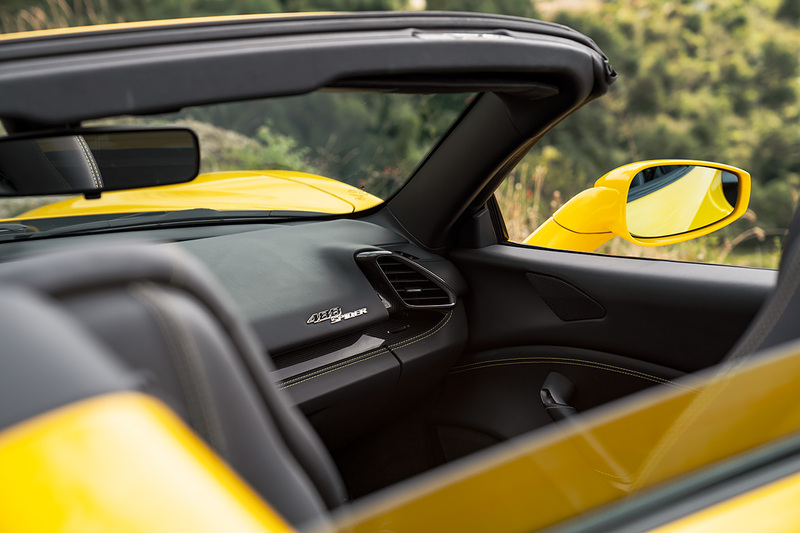 The scuttle shake convertibles often have wasn’t there – it was a really solid, stiff ride, to the point that I’ve nothing negative to say about the fact that it’s a convertible – which is remarkable. 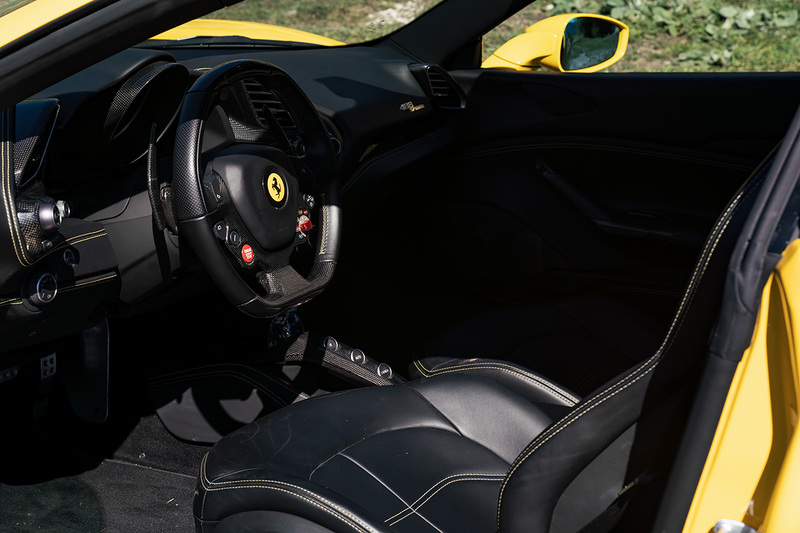 Most people would say a coupe is always going to be a better built car for fast driving, but with the 488 Spider it’s hard to, because if removing the roof doesn’t take away from the driving experience (but it does hide the engine which is a real shame), or add too much extra weight (it’s only 50 kg heavier than the coupe), what’s there not to like? 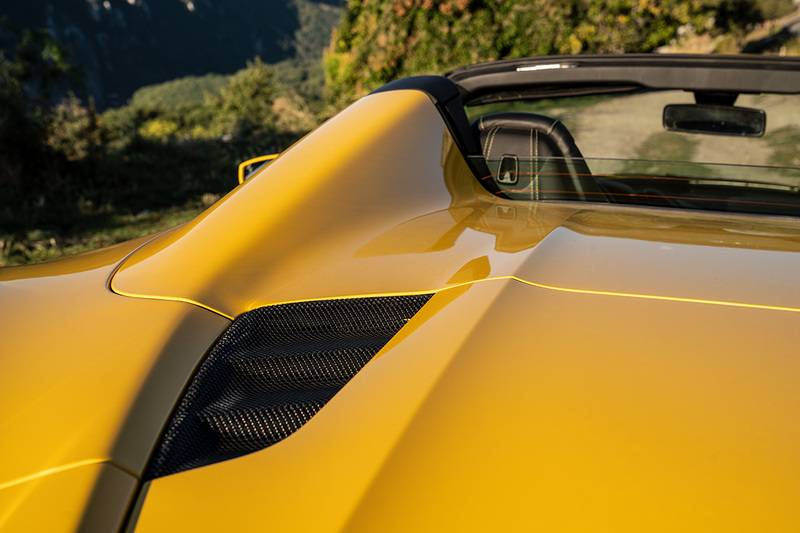 And it only takes 14 seconds to open or close the hard top – even whilst your driving at speeds up to 45 km/h. Up on Route Napoleon, as we were photographing the car, a family pulled up next to us. Out rushed the daughters, followed by their equally enthusiastic mum, asking us if they can take a photo standing next to the car. Back in the driver’s seat sits the dad, too cool to come out, but also unable to take his eyes off the car. 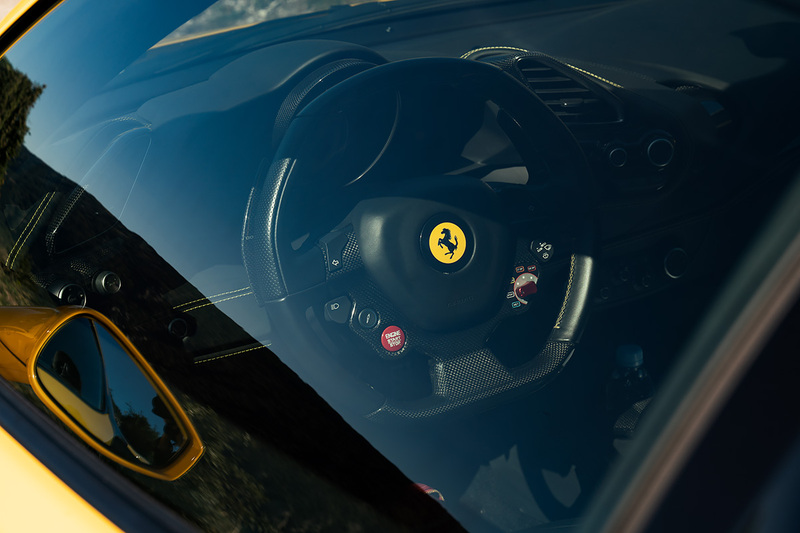 These are the occasions that I think any person who drives ‘something special’ can relate to – it’s the moment when you open the door of your car and ask them to have a seat instead, because that’s a much better picture. 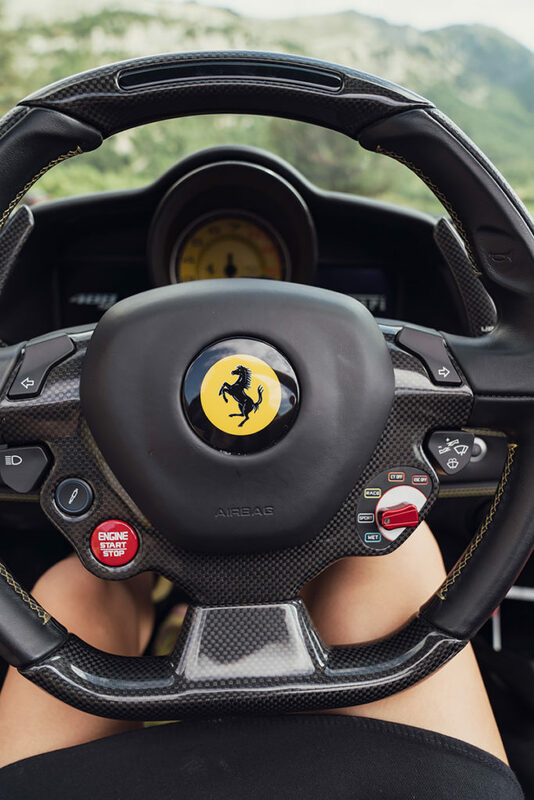 I remember the mum’s words before they left – ‘She has never sat in a Ferrari before, she’ll always remember this’. Would they have stopped if it was another car, or is this what owning a Ferrari should be all about? 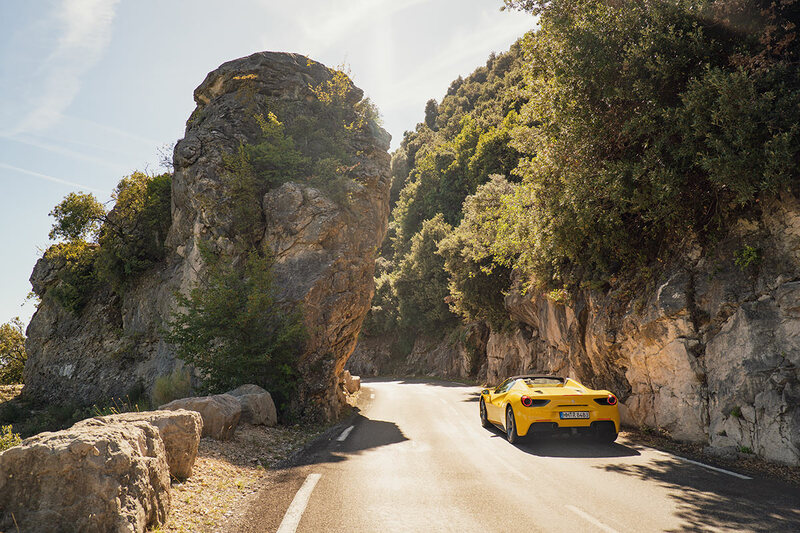 We headed from Route Napoleon to Monte Carlo’s Casino Square and, whether we were in the mood for it or not, all eyes were on us and the car – and this was in the mecca of supercars, where you’d think they’ve already seen it all. 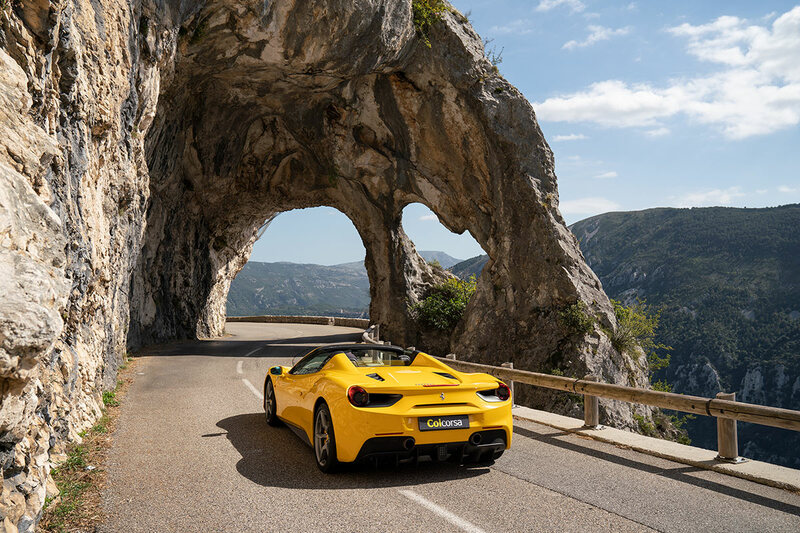 Yet a 488 Spider grabs the immediate attention of the people passing by. 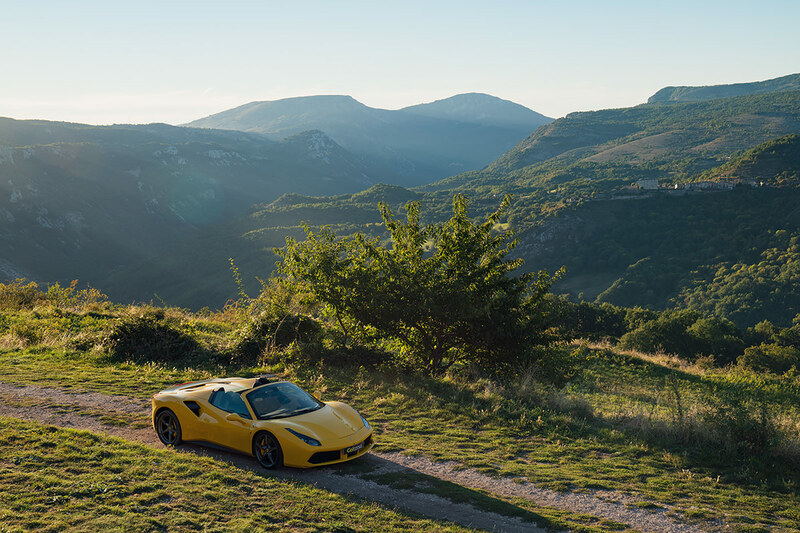 Dan said it was because I was driving, but I say it’s because the 488 Spider has a real road presence about it, and a deep rumble from the engine that draws you to it. 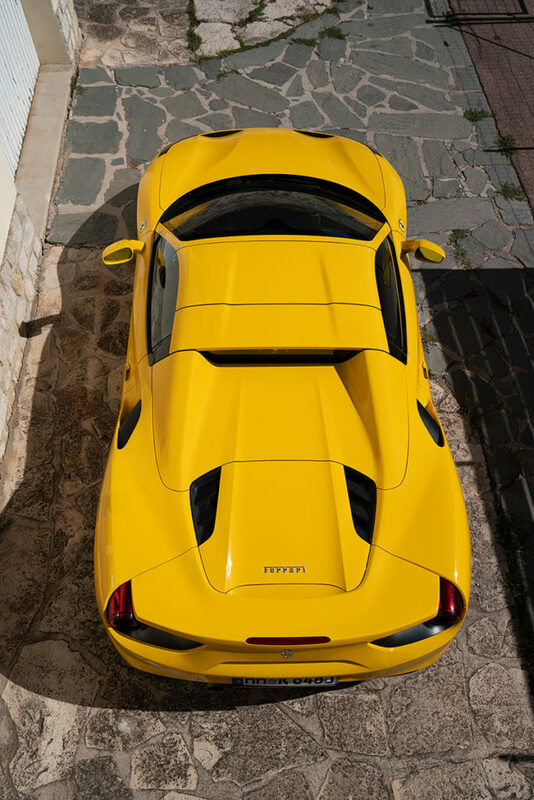 The gorgeous yellow paint that reflects the sunshine off the curves most certainly helps too. 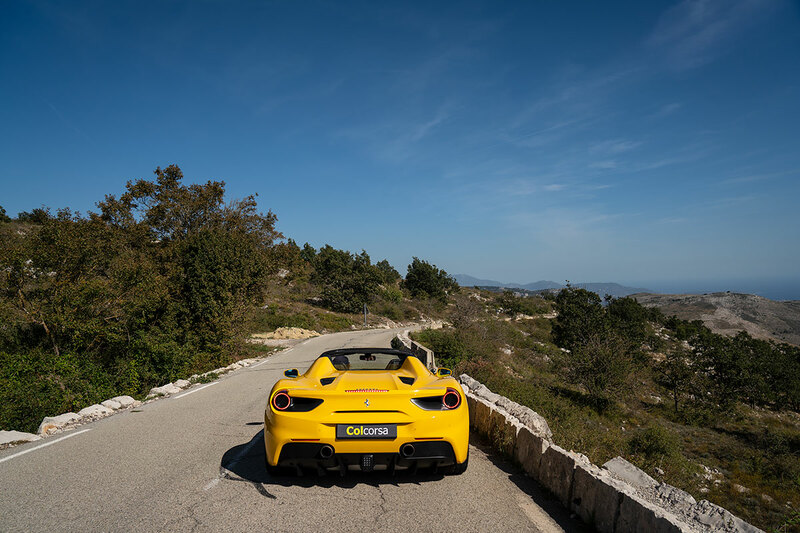 The thrill of the open road was soon pushed aside as we travelled at walking speeds over the Basse Corniche road’s horrendous speed bumps, designed by people who have clearly never driven a Ferrari. Slow, and sideways like a crab, we made our way home. 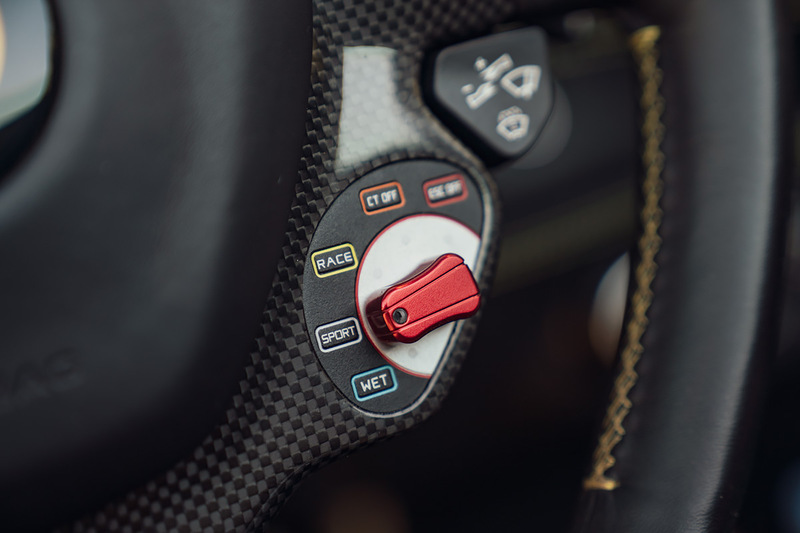 The front suspension lift button, which raises the car by 40mm, was in constant use. Annoyingly there didn’t seem to be a way to make the car stay raised for the next ten kilometers, where we knew we had at least 10-15 nasty blocks of tarmac to climb. 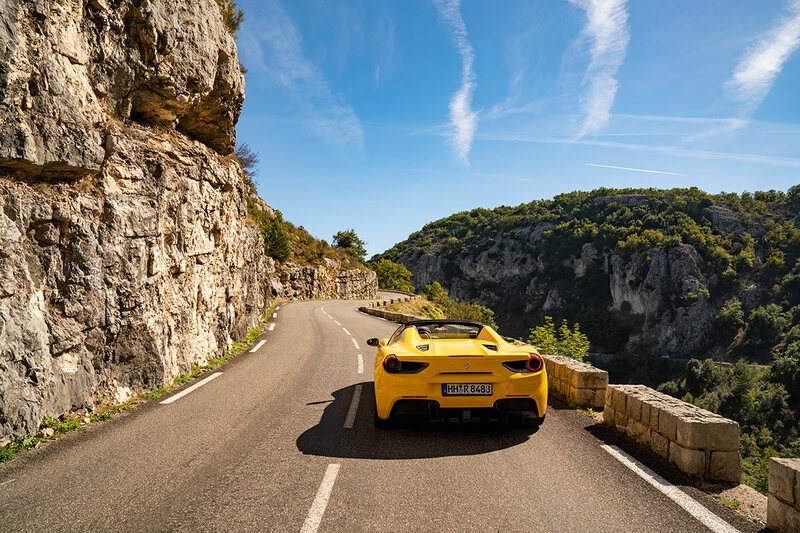 It’s a lot of car – with expensive panels – to care for in everyday use, unless you live in a place that doesn’t have any narrow lanes, uneven roads, speed bumps, or careless French drivers. 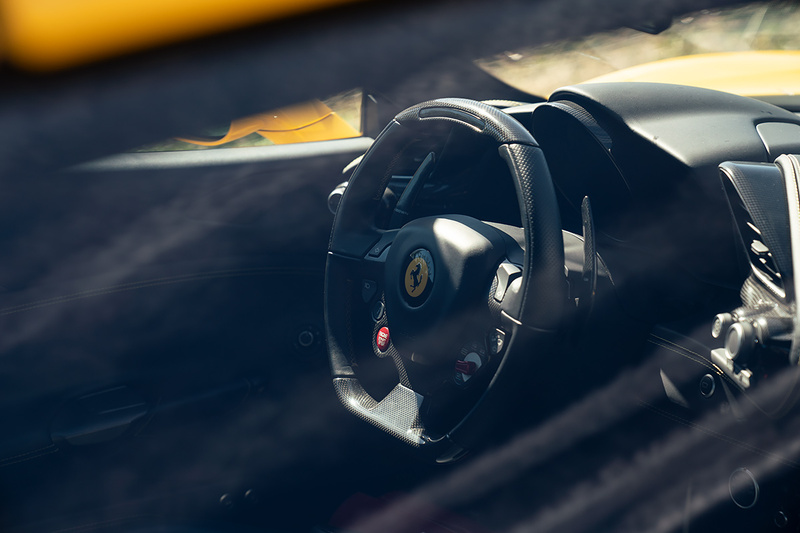 However the Ferrari 488 Spider makes driving a supercar for your daily feel so easy, so comfortable, and so like it was meant to be that way. And slowing down just gives people more time to admire the car. 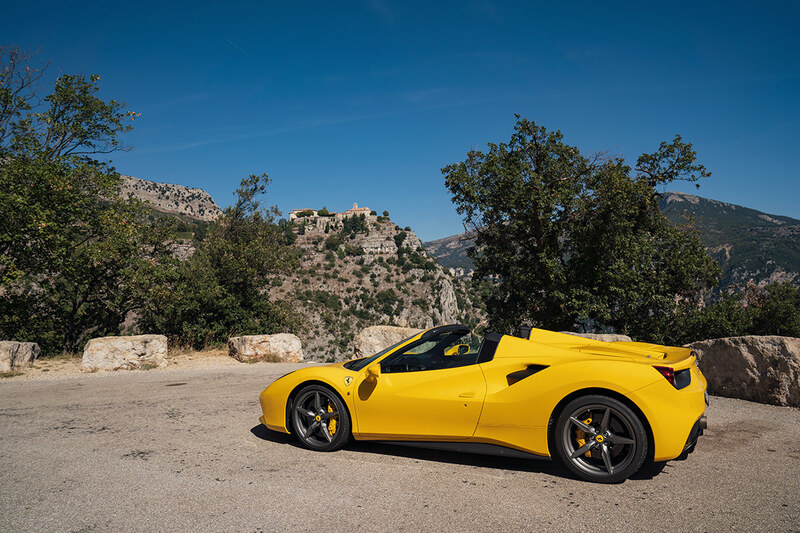 Dan wasn’t completely on the same page as me with regards to the Ferrari 488 Spider – once the car had left, he more or less forgot about it. We both liked the looks of it, and even Dan did admit driving the car was an ‘event’ – but his taste seems to be leaning towards more subtle cars. Cars that don’t turn every head as you drive past, but have the performance to keep up with almost any other car on the road. The BMW V8 M3 is without question one of those cars. 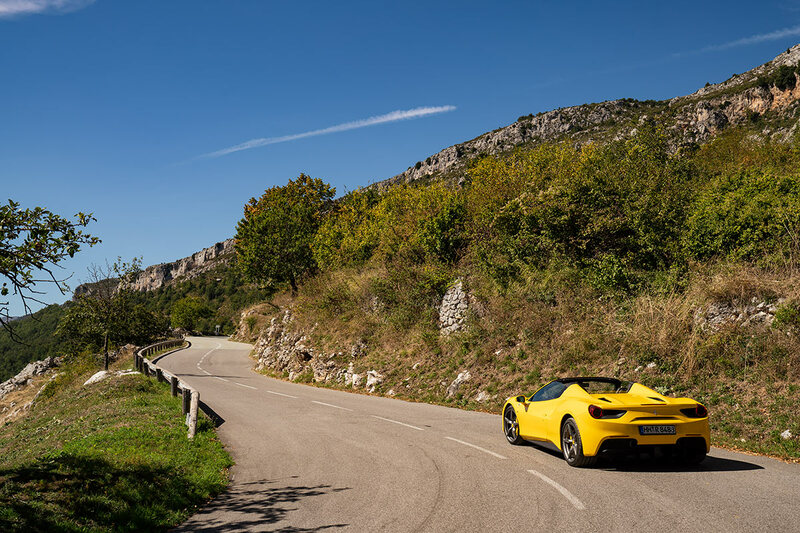 As we swapped over our cars in the middle of the drive after Route Napoleon, it became clear that the Ferrari 488 Spider is a monster in a straight line and on the gently winding tarmac – 0-100 km/h in 3.0 seconds is much faster than 4.6 seconds (or even 3.9 seconds as tested by Car and Driver), you can’t argue with that, and you reach high speeds ludicrously fast. 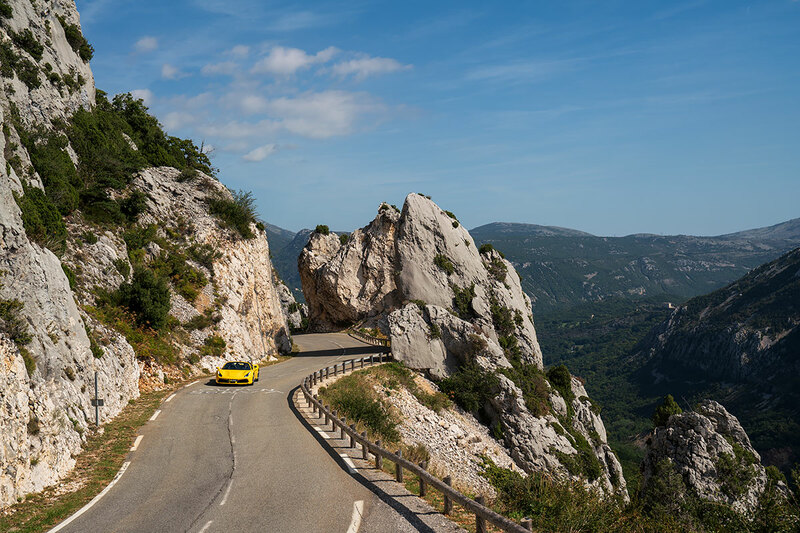 But then we arrived at one of my favourite passes up in the Alpes-Maritimes, where the blind bends, narrow lanes and sharp rock walls protruding out over the tarmac don’t allow for mistakes. You have to either know and trust your car’s cornering capabilities very well, or perhaps take it a bit more easy. 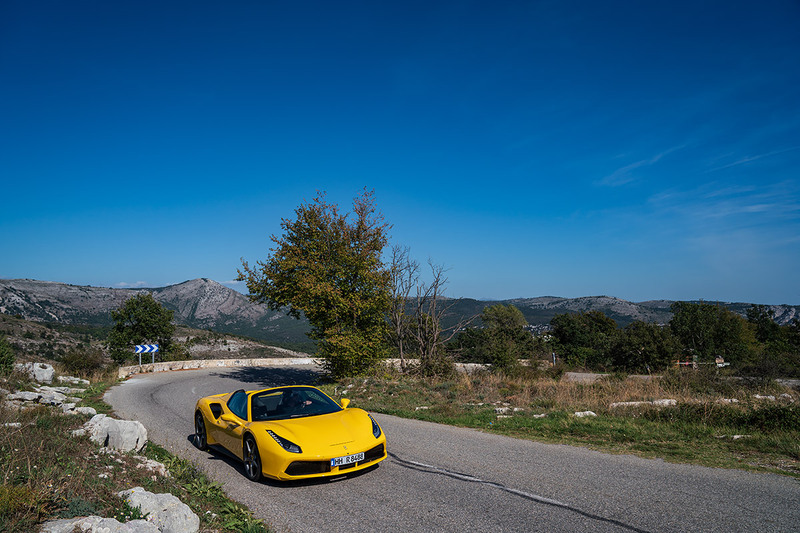 Because my allocated driving time was used up on Route Napoleon, I enjoyed that particular stretch of road in the V8 M3, and occasionally losing sight of the following 488 Spider in my rear view mirror I wondered to myself, is the Ferrari 488 Spider the best choice of supercar for the tight bends? 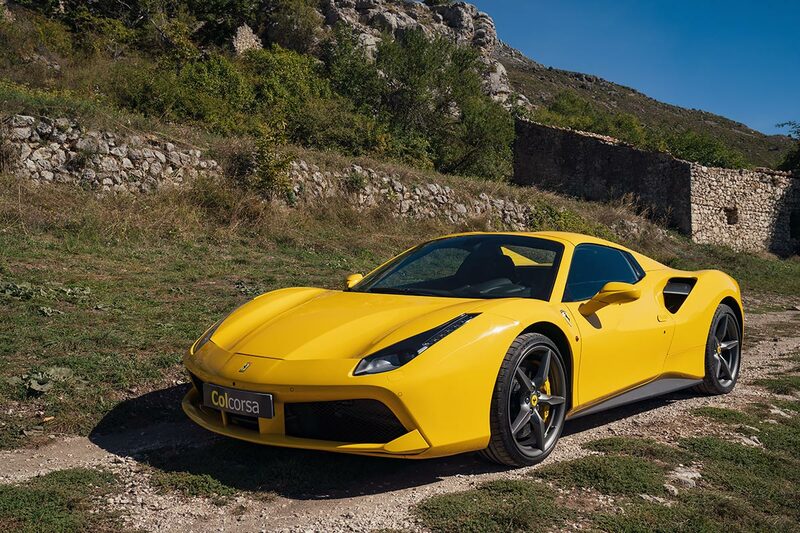 Or is it in fact just one of the best supercar all-rounders that seems to do everything very well, but perhaps nothing superlative compared to other similar high performance cars? 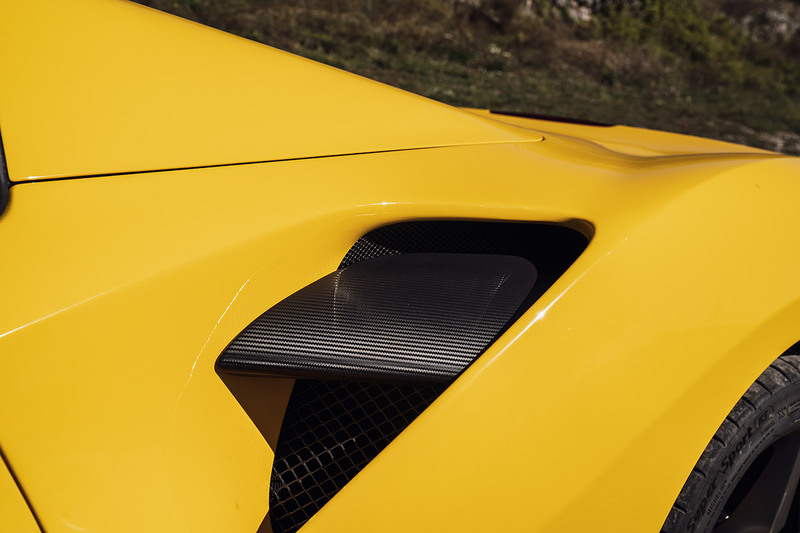 If it came to looks, I personally think Lamborghini and McLaren are stepping up their game with futuristic, innovative designs and shapes – whilst Ferrari is keeping it more classic. 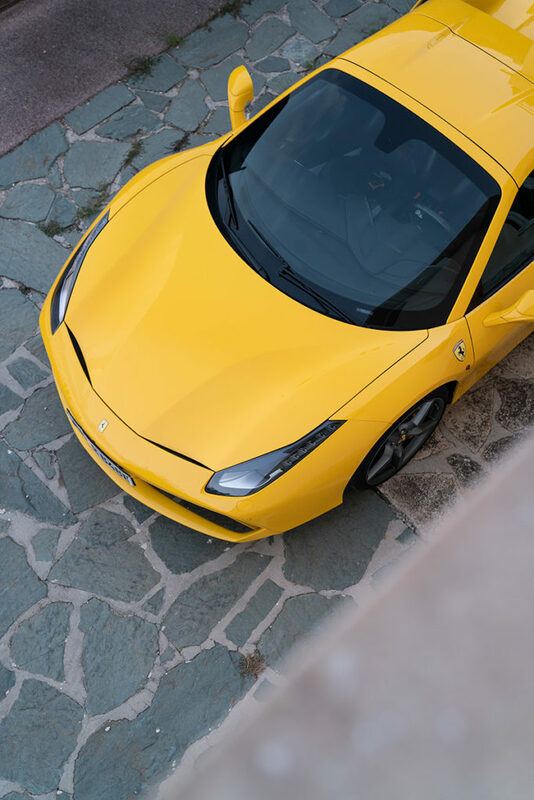 On the other hand if we fast forward 50 years the 488 might actually be a car that will age better, because sometimes less is more, and Ferrari knows how to stay true to their style. If it came to cornering on twisty roads such as the Route Napoleon, I think the 991 GT3 corners with more precision and road feedback, but I’ve also spent a lot more time getting to know one. 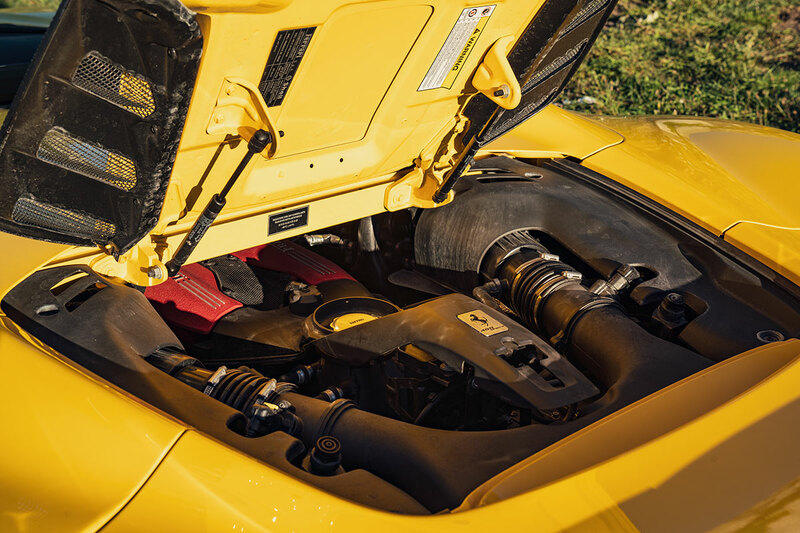 If it came to close-to-supercar-performance in a car you can ‘drive the doors off’ without too much worry about what a scratch will cost to repair, I’ve fallen for the V8 M3. I would recommend without hesitation a V8 M3 to anyone who doesn’t want to spend supercar money, but wants something fun to thrash around the corners. 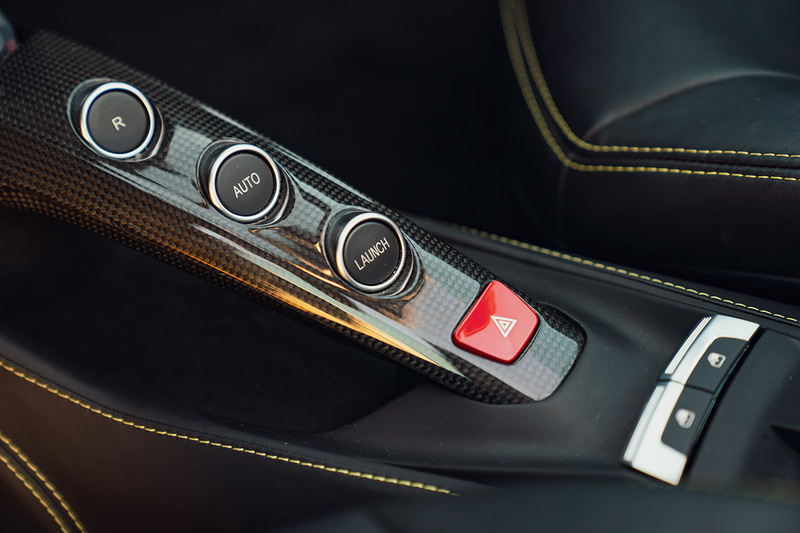 And when it comes to the sound, I think anything that is naturally aspirated will always beat the sound of a turbocharged engine, because although there is more of a delay before the ‘big bang’, it’s worth the wait as the needle on the rev counter rises higher towards the red line and the sound becomes raw, approaching mental. 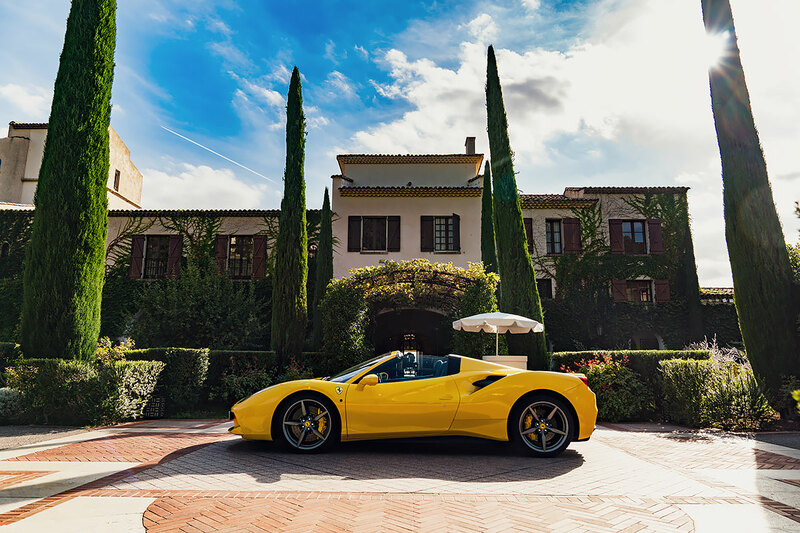 There are a lot of cars you can buy for this sort of money – or less. 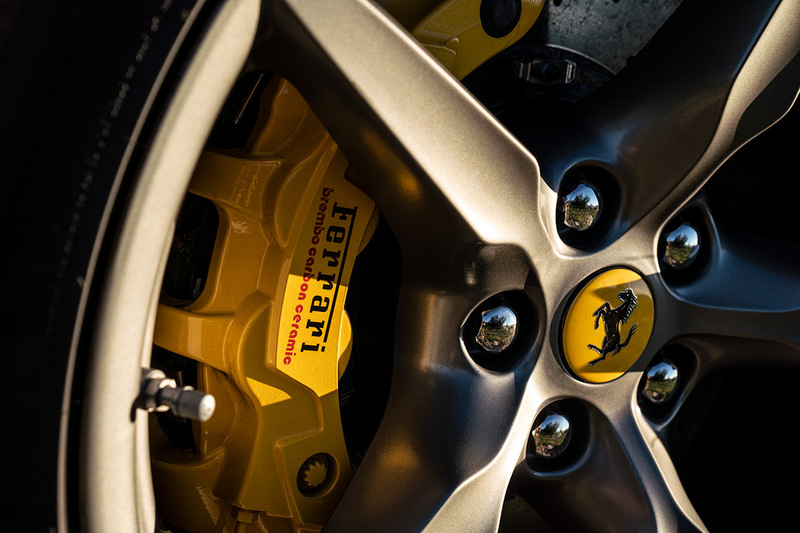 But the models mentioned above are not a Ferrari. 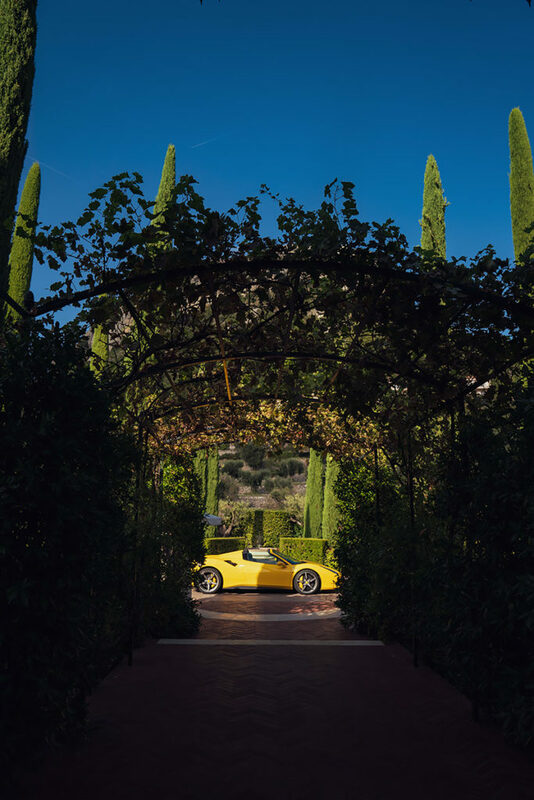 They don’t come with the heritage of being one of the oldest Italian supercar manufacturers – a brand that everyone recognises worldwide. 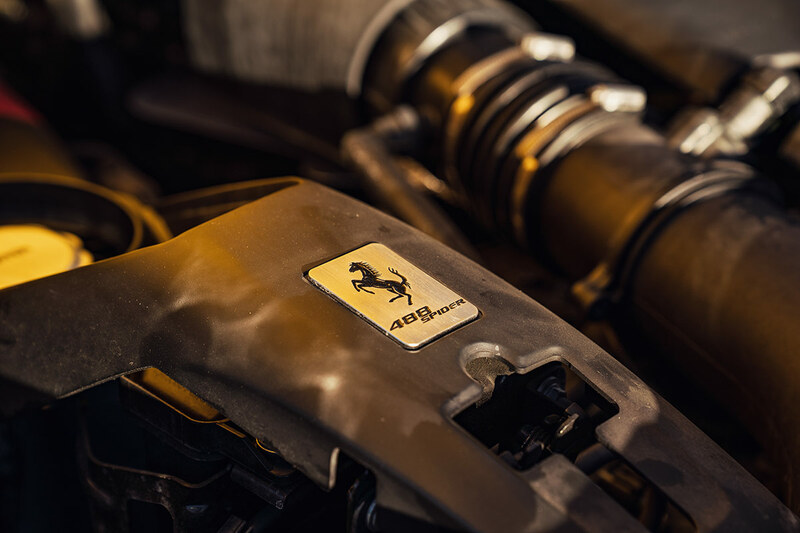 They don’t come with the prancing horse badge that also decorates the hoods of victorious race cars – such as Formula 1 world champions, and legendary Mille Miglia winners. 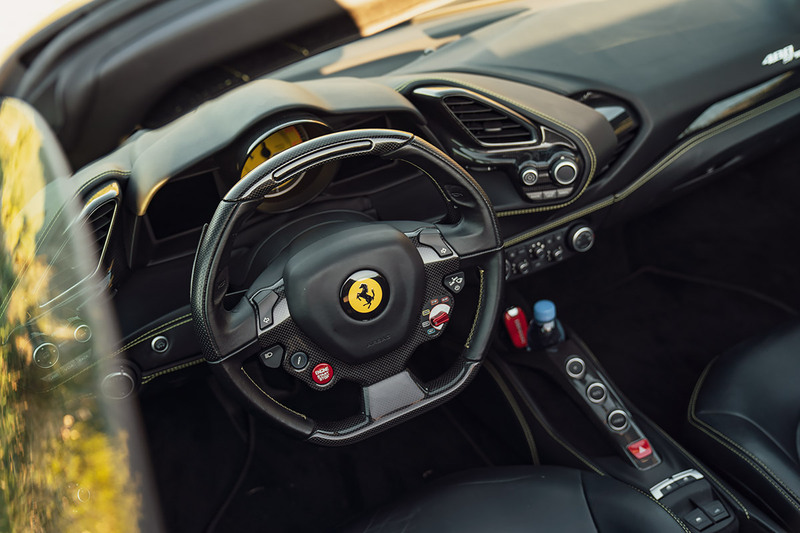 There is no question that the Ferrari 488 Spider is a special event to drive, or a dreamy daily driver if you can afford to run up the mileage. 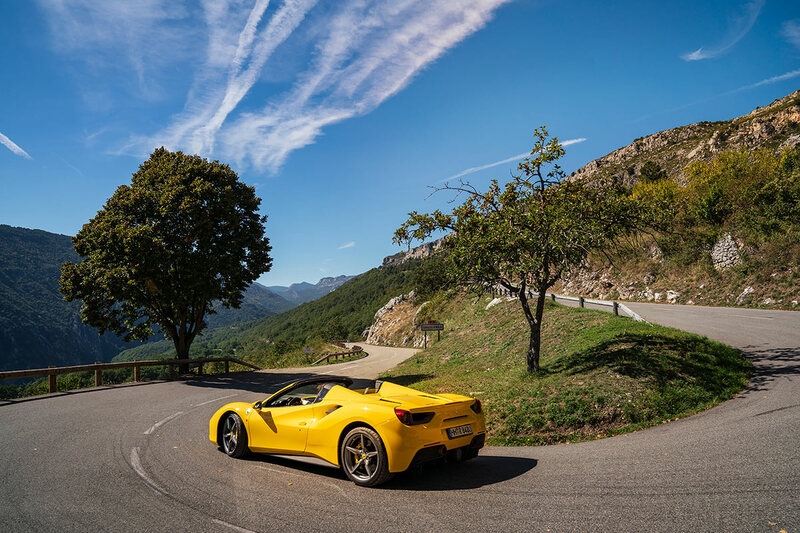 It’s also one of our most popular models for Colcorsa driving tours, so if we were to invest in a supercar, common sense says the Ferrari 488 Spider should really be the car to get. 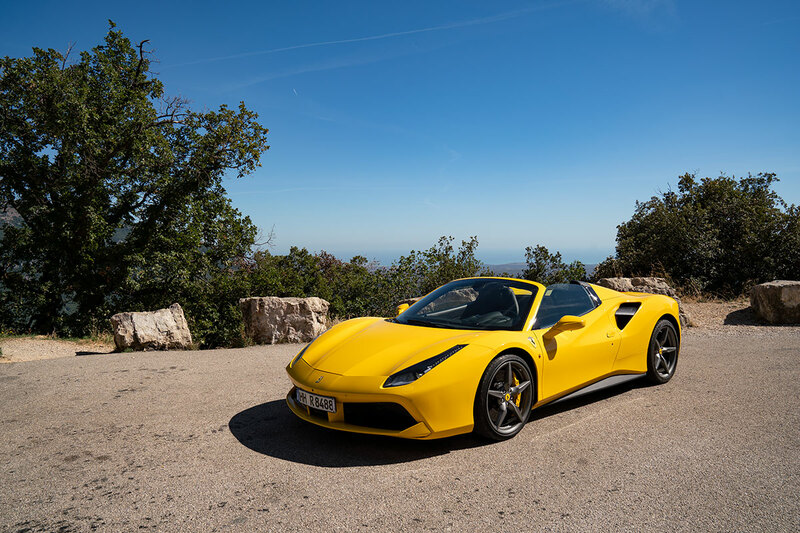 It’s very fast, yet easy to drive, it’s convertible, it’s striking – and we hear from customers all the time, ‘I’ve always wanted to drive a Ferrari’. But then you look at the sales prices and your dream falls apart. 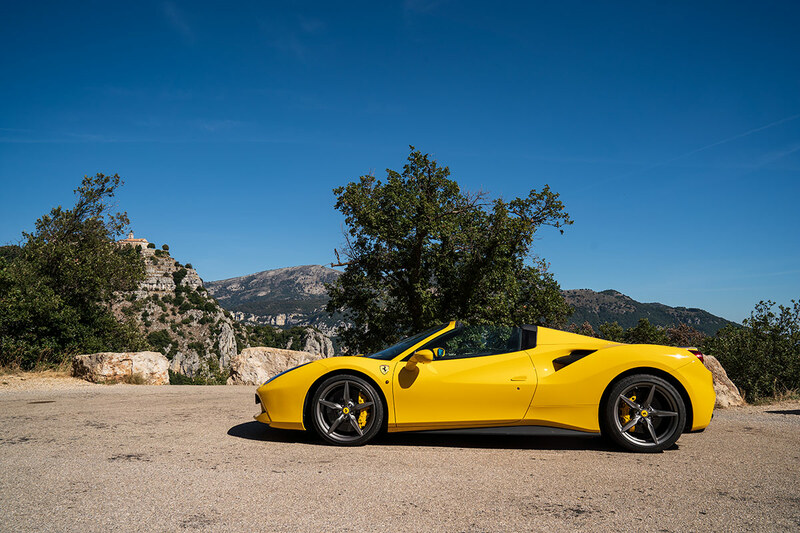 You can buy a Ferrari 488 Spider for about €225,000. Or you can buy my ultimate dream car – the 991.2 4.0 GT3 – for at least 50K less (and opting for the pre-facelift 991.1 GT3 could save you another 50K). 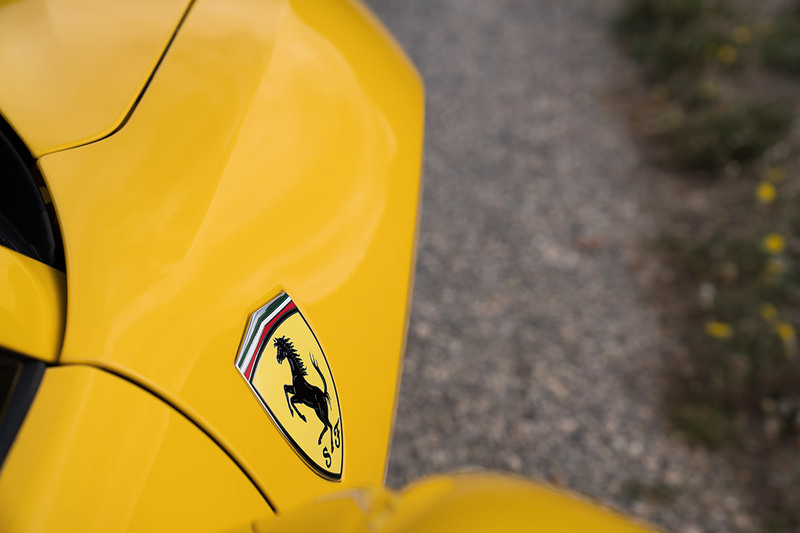 And a 50-100K premium even for such an iconic badge, only four or five hundreds of a second saved in a flat out straight line drag race, and a little more attention from your audience, is a lot of extra money to pay for something you can quite frankly live without. 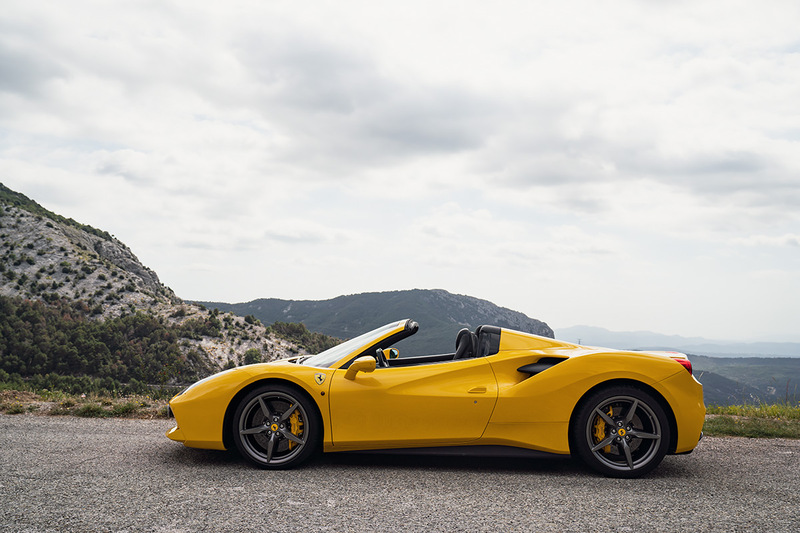 However, the Ferrari 488 Spider probably is the best convertible supercar you can buy in this price range – and if something more exciting is out there, I want to experience it. 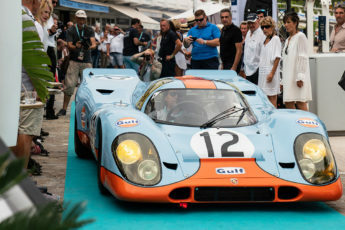 Saint-Jean-Cap-Ferrat Prestige 2018 - that Porsche 917!